Facebook is the most widely used social network these days. It allows people to share news, updates and life events with their friends and family. Recently I have shared some Cool Facebook Fun apps that were much liked by many Facebook users. 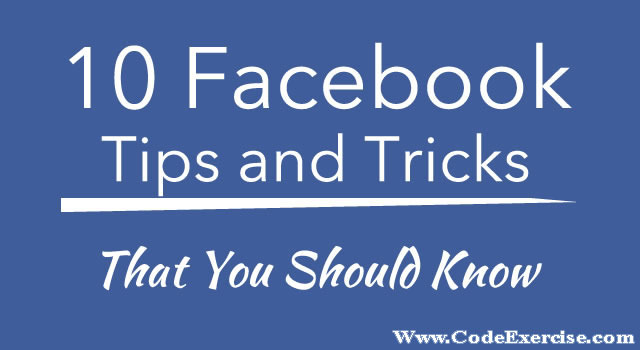 Today, I am going to share some secret Facebook Tips and Tricks that are really awesome. If you are a regular Facebook user then I am sure you will be aware of Facebook normal features like add/delete friends, update photos, status etc. How about learning something new about Facebook? That’s why I am going to share some amazing Facebook tricks today. Let’s come to the list of Best Facebook Tips and Tricks of 2017. Single images from Facebook can be downloaded easily. Unfortunately there is no option in Facebook to download bulk photos or whole albums. There is a handy Google chrome extension that can help you in this regard. Just install Bulk Download images (ZIG)extension to your chrome browser and you will be able to download albums from Facebook with single click. Install FVD downloader extension to your chrome browser and you will be able to download any video from Facebook just by single click. Learn some more tricks to download videos from Facebook. If you can’t access Facebook then still there is option for you to update Facebook Status. Login to Facebook account and from account settings, click on Mobile tab from left sidebar. You will find a unique email address that will be used to update Facebook status using Email. Using your favorite email client, send an email to that email address with Subject as the text you want to appear in Facebook Status. After sending email, see your Facebook profile with new status update. If you attach a photo with email and send it to your Post by email address, then it will be uploaded to your Facebook timeline with description as the title of your email. Using a Facebook application, you can easily track all your pending friend requests on Facebook. So, you will be able to see who has not accepted your friend request. You will also get list of friend suggestions using that application. For more information, read: Track Facebook Pending Friend Requests. By Using Fabulous extension for Google chrome, you can disable Facebook advertisements and enjoy cleaner Facebook look. Again using fabulous extension you can Customize background colors of Facebook website and add custom background images, change font size and styles etc. Enjoy a full zoomed view of any photo on Facebook regardless of its privacy settings and without clicking on it using Photo Zoom extension for Facebook. Using Facebook messenger for windows, you can access Facebook chat right from your windows desktop. Just install Facebook messenger for window sand enjoy Facebook chat directly from desktop. You can also check notifications, recent friend’s activity, friend requests and messages etc. from Windows desktop. You can show online status to selective friends using advanced chat settings on Facebook. You can Turn off chat for some friends or become visible for selective friends using advanced Facebook chat settings. You can create stylish font text styles for Facebook status and other social networks using simple tricks. For more information, read: Cool text generator for Facebook. You can choose a custom title and description for links you post on Facebook by clicking on them. You can now subscribe to updates of your favorite Facebook pagesand easily get notified as they update their Facebook page status. In order to do this, move your mouse over the page like button and click onget notifications. It is another cool Facebook trick that will let you send big files directly through Facebook. You can store files in the locker till certain number of days so that your friends can download them. In order to proceed, check the pipe appon Facebook. Live broadcasting on with a custom channel is now possible directly on Facebook using usteam. Using stream Facebook application you can record videos or broadcast live and share it with your friends and followers on Facebook. By using unfriend alerts application for Facebook, you can get notifications whenever any of your friends removes you from his/her friend list. Sometimes Facebook block accounts for sending massive friend requests to unknown persons. After getting blocked, you will not be able to send friend requests on Facebook even to people you personally know. Here is a cool trick that will allow you to send friend requests to people even if you are blocked. Login to Facebook account and get the email address of the person you want to add to as a friend. Then click here and you will be able to add friends by using different email services. Login with any of those email services and add your required contacts to Facebook. Finally upload that file through the previous window and your friend request will be sent to Facebook users with those email addresses. Have you noticed that recently Facebook recently introduced a new feature that notifies Facebook users whether their Facebook private message is seen by the receiver or not. If you want disable seen option then here is a nice Facebook trick for you. Just Install FB unseen extension to your chrome browser and your friends will never get notified when you read their messages. When you are not on computer or leaving for an important event, party function etc. and want to update status on Facebook then here is a cool Facebook trick for you. Later brois a nice application that can schedule Facebook status updates. You will have to select your time zone and then enter your desired status message, time and date for status update etc. and it will be scheduled accordingly. You may also schedule status updates to daily, every other day, weekly, monthly, yearly etc. Sometimes people disable Facebook chat and pretend as if they are not using Facebook. Now you can easily detect which friend is using Facebook secretly while keeping Facebook Chat offline. Online Now application for Facebook allows you to track hidden online friends easily. Facebook recently introduced stickers in Facebook chat and many new emotions are also added to Facebook chat. Here is another cool Facebook trick that will let you send any image to your friends via Facebook chat as emoticon. Click here and upload the required picture there. It will output some code that will print the same image in Facebook chats. Here is the Facebook chat code of ARWebZone Logo. By using Google chrome Browser, you can login to multiple Facebook accounts at a time. Open Google chrome and login to your Facebook account. Then click the settings tab and add a new user to chrome browser. It will open a new chrome window where you can login to other Facebook account. Now, you will be able to use and manage both accounts using the two chrome windows. In the similar manner, you can access as many Facebook accounts as you like using Google chrome. Are you bored with default blue color theme of Facebook? How about changing the colors and whole look of Facebook website for a cooler look? Here is another amazing Facebook trick that allows you tochange Facebook themes. Hundreds of stylish Facebook themes are available with a Google chrome/Mozilla Firefox extension named Facebook themes. You can also create your own custom theme for Facebook and access other themes at fbskins. By using this website, you can generate inverted or flipped text for Facebook chat messages or status updates. Type whatever you want and it will automatically generate inverted text of it. Copy paste the inverted text to your Facebook chat or status box and enjoy. You can also generate crazy and stylishcool text for Facebookand get chat codes for hidden Facebook emoticons there. It is another fun prank for Facebook that will let you create custom Facebook status updates, alerts, events on the behalf of others. Create custom status updates along with name of famous celebrities. Just visit thewallmachineand connect using Facebook account in order to proceed. Now you can modify Facebook home page with your own custom text etc. Just open Facebook.com using your favorite web browser and in the address bar, copy/paste the following code. When you open Facebook for login purpose, you have to fill two fields including username/email and password. By default the password boxes masked. You can convert it into a normal text box by modifying Facebook element code. So, after apply the trick, you will be able to see whatever is typed in the password field. First of all open Facebook pagan any web browser (I’m using chrome) and right click anywhere and select option named ‘Inspect Elements’. It will open the source code of Facebook. Press Ctrl+F and find the word password in the elements. You will find an input field whose type will be password by default. Just replace password with text and you will be able to see whatever is written in the password box. Facebook allows people to like their favorite stuff but you can’t dislike things that you hate. Facebook has not introduced dislike button till now. But you can still have dislike button along with like button for all stuff on Facebook. Just install Facebook dislike 1.1 extensions for chrome or add-on for Firefox. After installation of extension, you will be able to dislike Photos, status updates etc. on Facebook. So that’s all about Facebook tips and tricks that I learned till now. Tell me which Facebook trick you like the most? Also feel free to share these Facebook tricks with your friends.